Welcome to another development update. This time around, I will show how several players can join a game locally. As the descriptive text at the top says, other players can join simply by pressing 'fire' on their device. In this example, Player 1 had the gamepad assigned, and Player 2 joined thereafter by pressing 'fire' (in this example, the Ctrl key on the keyboard). The green square shows what kart Player 1 have selected, and the cyan square is for Player 2. Now, I joined myself, and I'm not that good at multi-tasking that I'll be able to drive two karts at the same time, but anyway we got to wait for the split-screen interface to be recreated. 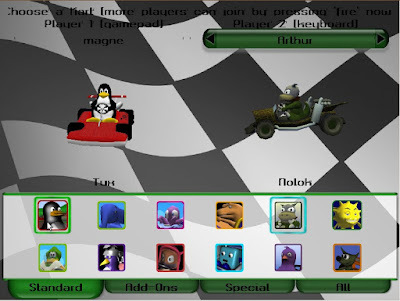 In the meantime, have fun playing SuperTuxKart 0.6.2, and please report any bugs you might find. Still possible playing two players on a keyboard? Gallaecio: not at the moment, we'll consider it though. Loving the new look guys. This is shaping upto be a very polished game. Are more than 2 players possible? Can't wait for this, looks awesome. The 'Press fire to join' idea sounds very arcade-y: Very good for a kart racing game. But what's all this about not being able to play two people on the same keyboard? @TheGeek: See our FAQ; most keyboards can only handle a few keypresses at the same time. If 2 people try to play on the same keyboard, keys will likely lock up - and then people think it's a STK bug, while it's a keyboard issue.